I've been refining my kebari tying techniques lately. I'm probably overthinking these simple flies, but these observations might help someone out. Flies always start with a hook. I usually choose the Gamakatsu Amago, a blind, barbless hook with a unique bend. I may use a smaller wet-fly hook for spookier trout. I rarely go bigger as the hookups on smaller fish can get messy. Blind hooks need an eye, and you have a few options. Silk cord, Dacron backing, monofilament and more. Most of my flies have been tied with the persimmon-dyed silk cord. I use a drop of varnish at the base of the loop to help hold the loop open. I wanted to try out traditional silk gut: the stretched and dried silk glands of the bombyx silkworm. Unfortunately, while very strong, is also very expensive. A cheap substitute is monofilament, finely sanded and twisted. Four strands of 6x twisted together fit well on an Amago, and it's plenty strong. I tie eyes onto a batch of hooks at a time, using well waxed Veevus 8/0. Every eye gets pull tested with a bodkin before it leaves the vise. I now prefer using silk as my tying thread for kebari, especially thread bodied flies. Pearsall's Gossamer is the standard for fly tying, but I actually prefer Pearsall's Naples for kebari. The Naples is a larger diameter which makes a very pleasing body. The downside of that larger diameter is that it's unforgiving of superfluous wraps. Wax the thread well and lock materials with the bare minimum of wraps. I'm only using grouse and partridge now as hackle. I like the natural look, the feathers are the right size, and it's easy to wrap. A lot of the hen feathers I used seemed a little too big. Pheasant is way too big. I tie both shaggy dubbed bodies and thin thread bodies. Most of the time, the specific pattern doesn't matter. If I could only use one pattern for everything, it would be dark, shaggy (Dexter the dog's fur! ), and sport an orange hot spot. Hopefully this inspires a few people to experiment with new kebari. This was the first pattern I ever tied, and it's still one of my favorites. Those are some good looking flies!!!!! I caught my first Tenkara fish on a Kebari (cutthroat). 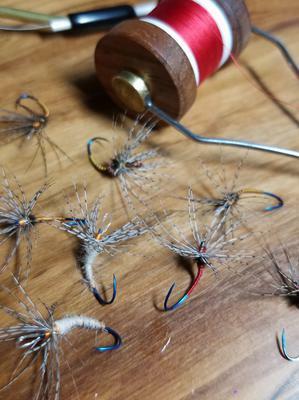 I know they work, and am just getting started tying them. Your information was very helpful. Your post cost me! I just placed a hook order to Tenkarabum! That said, I have been tying some flies on the big eye hooks from Chris. I really like these hooks. I am going to tie some Kebari with the quail feathers I have collected this year during my hunting. I have some Sage Grouse, Pheasant, Spruce Grouse, Ruff Grouse, Dusty Grouse, Hungarian Partridge, and Chukkar too. I'll have to try some of the orange fur from my Brittany "Frankie." It is always more fun to catch fish with a fly you have tied. Those big eye hooks look a lot like the Hanak 0500 that I use when I can't get Amagos. Can't go wrong there. If you are tying eyes on, just make sure to test them on the vise. You want to be able to trust them 100%. Tie some 5x tippet onto a few of them and pull to tippet (hopefully) failure. I jealous of your hackle selection. My hunting friends need to get their act together.